"at Firoz shah Kotla chase is usually difficult, average score by 1st bat is approx 165 runs that can be defend easily"
Chris Morris can come in Playing11 replacing Kemo Paul. more Must watch Video will be available in the noon. Dinesh Karthik (C), Anrich Nortje, Joe Denly, Kuldeep Yadav, Lockie Ferguson, Prithvi Raj, Sunil Narine, Andre Russell, Carlos Brathwaite, KC Cariappa, Shubman Gill, Harry Gurney, Robin Uthappa, Chris Lynn, Piyush Chawla, Nitish Rana, Prasidh Krishna, Sandeep Warrier, Rinku Singh, Shrikant Mundhe, Nikhil Naik. 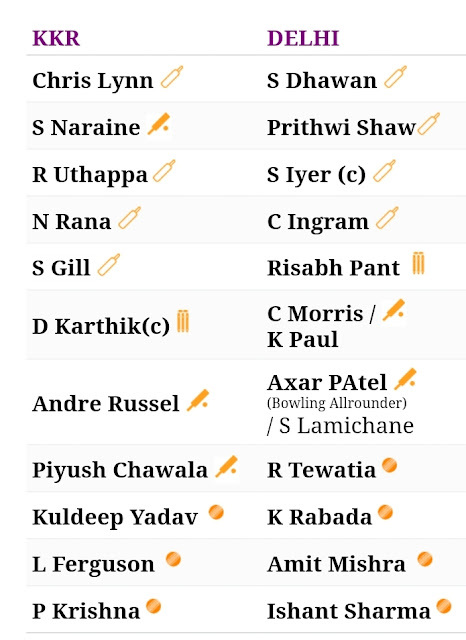 Shreyas Iyer (C), Rahul Tewatia, Shikhar Dhawan, Rishabh Pant (wk), Sandeep Lamichhane, Manjot Kalra, Bandaru Ayyappa, Colin Ingram, Ankush Bains, Nathu Singh, Colin Munro, Chris Morris, Kagiso Rabada, Trent Boult , Hanuma Vihari, Axar Patel, Ishant Sharma, Sherfane Rutherford, Prithvi Shaw, Amit Mishra, Avesh Khan, Harshal Patel, Keemo Paul, Jalaj Saxena.